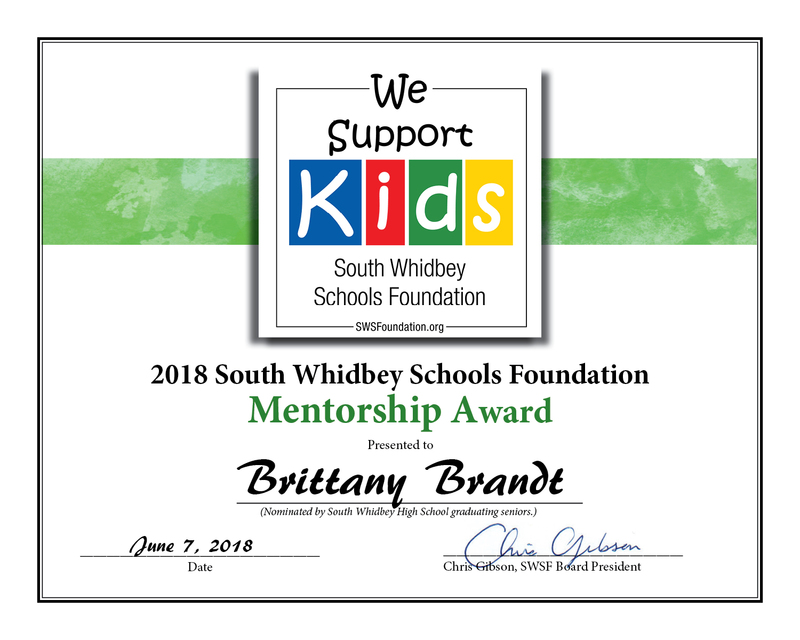 High School seniors voted for Brittany Brandt to receive the 2018 Teacher Mentorship Award for enhancing school spirit and providing exemplary mentorship in the Leadership class she taught, which provided students with the opportunity to do projects benefitting the South Whidbey community. Chris Gibson, Foundation Board President, announced the award at the June 7 Seniors school assembly and Brandt was presented with the plaque by School District Superintendent Jo Moccia at the June 15 district staff assembly. In addition to an award plaque, Brandt received a $500 check from the Shapiro/Valis Teacher Mentorship Award endowment. Holding back tears, SWHS senior Bailey Gochanour read aloud her nomination of math teacher Tim Durbin for the “Excellence in Teaching: Mentorship Award” at the farewell assembly. The award was established by Steve Shapiro, MD, and his wife, Debora Valis, for students in the community to acknowledge and honor the leadership, mentorship and inspiration of specific teachers. “I nominate Mr. Durbin for this award because he has had a tremendous impact on the way I view math. I struggled with math a lot all through elementary school and middle school! It was one of those subjects that frustrated me and I just could never find much of a point in it. “I had Mr. Durbin for Geometry my freshman year and Algebra 2 my sophomore year, and he changed all of that for me. He got me to look at math as a useful tool, rather than a core curriculum chore that I needed to do to graduate and go to college. He rewarded hard work, rather than correct answers, which encouraged me to do my best and try my hardest, while taking a lot of the pressure and stress off that usually come with doing math… His philosophy was that if we were willing to put in our effort and time and energy into understanding, he would put his in to helping us improve. “I really, really respect that teaching style. Mr. Durbin made me enjoy math, and it is now one of my favorite subjects. His extremely positive attitude inspired me every day, and it made his classroom a bright, safe, fun environment to be in. He is at school to help his students before, during and after school despite his long commute from town and his kindness is something that changed my outlook in many respects. Mr. Durbin really deserves this award,” Gochanour said. 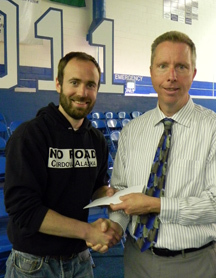 In addition to an award plaque Durbin received a $500 check from the Shapiro/Valis Teacher Mentorship Award endowment. SWSF’s annual Mentorship Award recognizes teachers, principals and other school-based staff who exemplify the kind of commitment to students that creates exceptional results. Graduating seniors nominate a teacher who has had a lasting positive impact on their lives. South Whidbey High School math teacher Andy Davis was presented with the award by graduating senior Grace Houck at the school’s farewell assembly at the High School June 9. SWSF’s annual Mentorship Award recognizes teachers, principals and other school-based staff who exemplify the kind of commitment to students that creates exceptional results. Graduating seniors nominate a teacher who has had a lasting positive impact on their lives. This year there were 21 nominations for 13 different teachers. 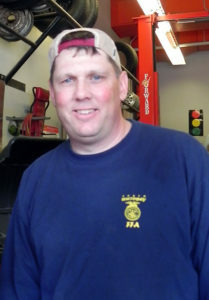 Leading the nominations and this year’s recipient is Chad Felgar, also a South Whidbey alum and currently the high school shop and agriculture teacher. “He always keeps students busy with new, fun projects,” wrote one senior. “Mr. Felgar has influenced me to be the best I could possibly be. He has given me the confidence to be who I am,” wrote another student. “(Mr.) Felgar showed me what it is like to have a job, good work ethic and to be a leader,” commented another student. “He’s pretty chill, he does all types of classes and he does them well,” wrote another senior. Felgar, who will be leaving the district next year, received the award and the accompanying cash stipend at the Farewell assembly to resounding applause from the senior class. The award was established by Steve Shapiro, MD, and his wife, Debora Valis, for students in the community to acknowledge and honor the leadership, mentorship and inspiration of specific teachers who have unlocked the doors to the future for their children. The Mentorship Award, which acknowledges and honors current members of the South Whidbey School District Faculty who have had a lasting positive impact on members of this year’s graduating seniors, was awarded for the very first time to a pair of teachers who have taught for decades at the South Whidbey Elementary School, Bruce and Kathy Callahan. . . . In nominating the Callahans for this year’s award, graduating senior Chantel Brown wrote: I had Mr. and Mrs. Callahan my fourth and fifth grade years. They taught me so many things that I had not learned before ..my love for math…love for helping others…If you need to start at a lower grade level they start you there and work with you to progress where you need to be …such an inspiration for me ….make me want to excel in every way possible…push you to be the best student you can be.” . . . Similarly, graduating senior Maia Sparkman added: “The Callahans were my teachers for third, fourth and fifth grades…we have managed to stay in touch ..I want them to be recognized because they taught me a lot of life lessons that I use to this day.” . 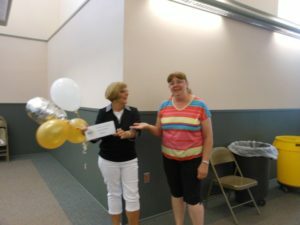 . .
On June 13 at South Whidbey High School’s Senior Class Farewell Assembly, English Literature teacher Jennifer Gandarias, received the Foundation’s Mentorship Award along with a $500 check. This annual award was established by Steve Shapiro, MD and his wife, Debora Valis, for the purpose of allowing students to acknowledge and honor the leadership, mentorship and inspiration of specific teachers who have contributed the most to their success throughout their education at South Whidbey schools. Seniors Lennox Bishop and Tyler Helvey, who nominated Ms. Gandarias for the award, joined retired educator and South Whidbey Schools Foundation Secretary Jean Shaw in presenting the award. Lennox Bishop wrote in her nomination that, “Mrs. G. is an exceptional teacher. She goes above and beyond by not only challenging her students, but by truly investing in each one personally. She has a passion for teaching and it is evident. She has supported me through some of my greatest struggles. She inspires me every day.” Gandarias was also a recipient of the Foundation’s Extra Mile Award for the 2009/10 school year. 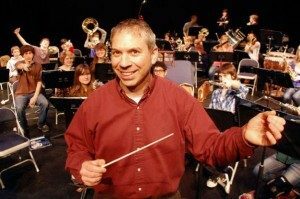 Chris Harshman, Music Education Teacher and Band Teacher Harshman received The 2012 Excellence in Teaching: Mentorship Award, based on nominations made by members of the high school graduating class for leadership, mentorship, and inspiration. Graduate Sidney Hauser wrote in her nomination of Harshman that “He is the most motivational and influential teacher I have ever had. He sees potential in everyone and encourages everyone to try hard and do what they love.” In an April 2012 South Whidbey Record Hometown Hero article about Harshman, Hauser is quoted as saying, “Mr. Harshman is one of the most inspirational people I have ever met. He’s a teacher and so much more: life coach, friend, musician, parent and always young at heart. The belief he invests in his students gives us the motivation and encouragement to ‘raise our bar’ inside and outside of class. “Although life can sometimes be as thick as red clay, Mr. Harshman always wants the best for us. For all we know, most of us would not be the people we have become without him, especially myself. “There will never be another person like him. His love for music and life has rubbed off on me, and will rub off on anyone who ventures too close, so watch out!” Hauser presented Harshman with the award and a $500 prize at the Senior Class Farewell Assembly held at South Whidbey High School on June 7. Nels Berquist (shown left, with then SWHS Principal Rod Merrell) was selected as the 2010-2011 Mentor Teacher by South Whidbey High School seniors, is a fourth generation Whidbey Islander, who became a teacher to “…give back to the community that is my home.” For the past eight years, Berquist has taught in many disciplines and levels ranging from fourth and fifth grade mathematics to LMS social studies, English, PE and Health, to SWHS Creative Writing and Public Speaking. Reviewing his many experiences, Berquist comments: “I have, in particular, enjoyed working with the staff and students of Langley Middle School. The high level of creativity of the middle level teachers spurred my desire to innovate. Greg Willis, the long-time principal at LMS, was a leader that I looked up to during my early years with the district. My fondest memories involve the five years I taught Adventure Education at LMS, which included over fifteen backpacking trips to California and the Washington Coast.” One of the student nominations stated that Mr. Berquist had “changed my life,” and “really helped me find my inner voice.” Others mentioned that he is generally, “awesome.” Clearly, Berquist’s reflection that over his career he has “…enjoyed the creative pursuit of inspiring youth,” has made a difference to the many students in the South Whidbey School District who have been inspired by his teaching and leadership. David Nelson, mathematics teacher at South Whidbey High School since 2000, is the 2009 recipient of the Mentorship Award. Nelson is appreciated by students as one who cares about their learning and makes every effort to help them learn math. Cayla Calderwood, graduating senior, wrote: Mr. Nelson is great at interacting with students. His ability to capture math in plain English helps his students understand easily…. And he manages to capture students’ interest with his own excitement in his subject. This award is based on nominations made by members of the graduating class of teachers in the South Whidbey School District who have contributed the most to their success. The award is funded from an endowment established by Steve Shapiro and Debora Valis to honor South Whidbey teachers for their dedication to and influence on our students and from donations from the community. The award includes a $500 cash gift. Gene has been an inspiration to students for many years at South Whidbey High School with his hard work, dedication and creative skills. His commitment to the skills to help students prepare for life beyond high school is keenly appreciated. He has spent many years preparing beautiful yearbooks simply by going the “extra mile”. In 2008, the Foundation created a special award, the Steve Durbin English and Literature Award, to recognize the contributions of Steve Durbin, retiring after a 37-year teaching career and recipient of multiple teaching awards and prizes at local and national levels. 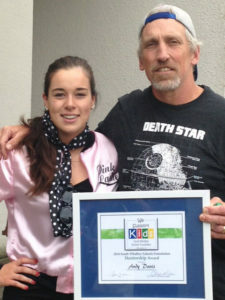 For inspiring students to excel in science, for making school fun, for making science entertaining and involving and for being a phenomenal teacher who takes education beyond all known limits, Rachel Kizer was recently awarded the Mentorship Award for Excellence in Teaching by the South Whidbey Schools Foundation. Tom Kramer, social studies teacher and tennis coach at South Whidbey High School, was awarded the 2006 Mentorship Award for Excellence in Teaching by the South Whidbey Schools Foundation. Kramer was nominated for the award by seven graduating seniors and senior Janelle Iversen assisted SWSF President Dave Haworth in making the presentation at the High School Awards Ceremony. Jenny Gochanour, Spanish teacher at South Whidbey High School, was awarded the 2005 Mentorship Award for Excellence in Teaching by the South Whidbey Schools Foundation. This award is based on nominations made by members of the graduating class of teachers in the South Whidbey School District who have contributed the most to their success. Jenny was nominated for the award by Jennifer Gaveling. 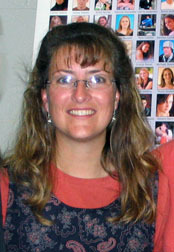 Paula Ludtke, a vocal instructor and English teacher at South Whidbey High School received the 2004 Endowment for Excellence in Teaching Mentorship Award. In nominating Ludtke, senior Jessica Eggland noted that when she came to South Whidbey two years ago, Ludtke accepted her into the choir class with open arms. Eggland said that Ludtke has a unique way of disciplining students with respect, has an extraordinary ability to care for others and always encourages students to become better people. Scott Mauk, formerly a Bayview High School teacher, was presented the third annual Endowment for Excellence in Teaching Mentorship Award of the South Whidbey Schools Foundation at the Bayview High School Awards Barbeque. Mauk taught history at Bayview. In nominating him, senior Janelle Petanovich noted that although when she came to Bayview she didn’t care about school, Mauk has a unique way of teaching which captivates and draws her in. He has made her want to learn even more and to be a better student. Mauk received a degree in anthropology from Santa Clara University and a Masters in Teaching from Evergreen College. 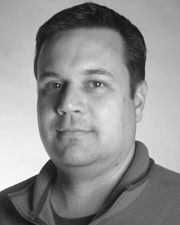 He came to the South Whidbey Schools in 1996 and previously taught at the Alternative School on Bainbridge Island. He and his wife Anne have two sons and live on an organic farm in Freeland.